Ring Jets also known as Steam Jet Ejector/Liquid Ring Pump Combination Systems. They are a combination of steam jet ejector system followed by intercondenser and water/liquid ring vacuum pump. This system can achieve vacuum as high as 0.05 Torr. 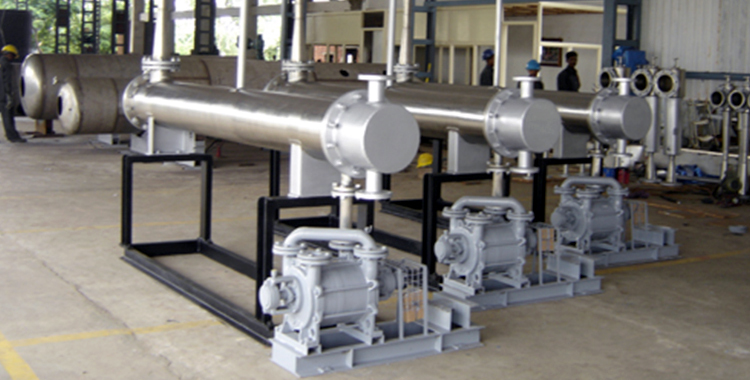 Our Ring Jet systems consist of single or multi-stage ejectors, single or two-stage liquid ring vacuum pumps and intercondenser. It is designed to operate at the same capacities and suction pressures as conventional ejector systems. In special cases, to avoid contamination of seal water, the closed loop for seal water cooling with indirect cooler, gas liquid separator, re-circulation tank and instrumentation is provided. The system can be installed at any elevation and is normally very compact and is easy to install. Our Ring Jets provide a solution for high vacuum operations. They are versatile in handling both wet and dry loads; they are low level skid mounted packages fully instrumented. They offer clear energy savings and are custom designed. Highly energy efficient processing equipment are mandatory for any industry considering the ever increasing utility costs. Our Ring Jets, installed at low levels, are specially designed to take care of the energy consumption, while pulling high vacuum in various applications, in all processing industries. We have innovated the most efficient Ring Jet Systems with the best combination of ejectors and vacuum pumps, offering the highest possible thermal efficiencies to the industries. We have also developed Ring Jets with closed loop seal water re-cycle system for vacuum pumps for the total reduction of effluent. 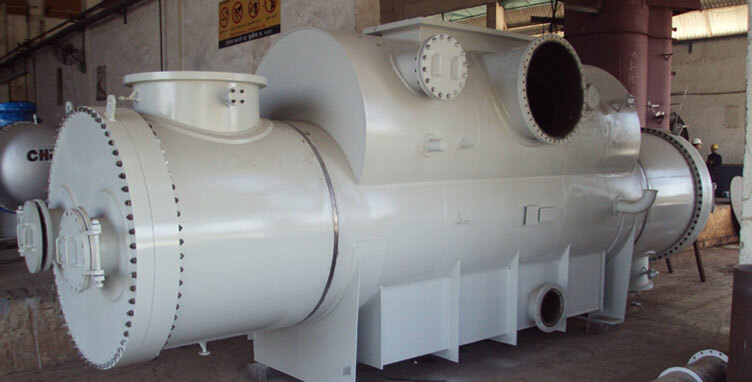 The suction of the first stage ejector is connected to the process line to evacuate and entrain gases, vapors or air to maintain the consistent vacuum in the plant during the process. As per the suction pressure requirement the first stage ejector compresses the process vapor to the designed inter-stage pressure which may be selected between 8-14 mbar. The second stage ejector will take over the load from the first stage and further compress the suction gas along with the first stage steam into the surface condenser. The surface condenser is designed to condense the condensable gases and steam from the ejectors to eliminate the load onto the following stage which is the vacuum pump. The non-condensable gases/air along with the condensate produced in the surface condensers are sucked by the water ring vacuum pump. The vacuum pump is designed and selected to operate at optimum inter-stage pressure. The vacuum pump will further compress the non-condensables to the atmospheric discharge. In special cases, to obtain economy for effluent treatment the water ring vacuum pumps are provided with seal water re-circulation arrangement with cooler, gas liquid separator, re-circulation tank with instrumentation. Our Ring Jet systems comprise of Multi-Stage Ejectors, Single & Two-Stage Liquid Ring Vacuum Pumps and Condensers, and operate at the same capacities and suction pressures as conventional Ejector Systems. Our Ring Jets are installed at major chemical, pharmaceutical, food and various processing industries throughout India, where they provide energy efficient and consistent service for a wide variety of processing applications.